Placentophagy is when a mother eats her own placenta. I wrote an earlier post about how most of our cows do this. But I never allowed the sows to do this, preferring to keep the environment neater. But as I’ve transitioned from my parents’ heated farrowing barn to outdoor and hut farrowing, I noticed something. If I wasn’t able to reach into the hut and take out the placenta right away, it would disappear. 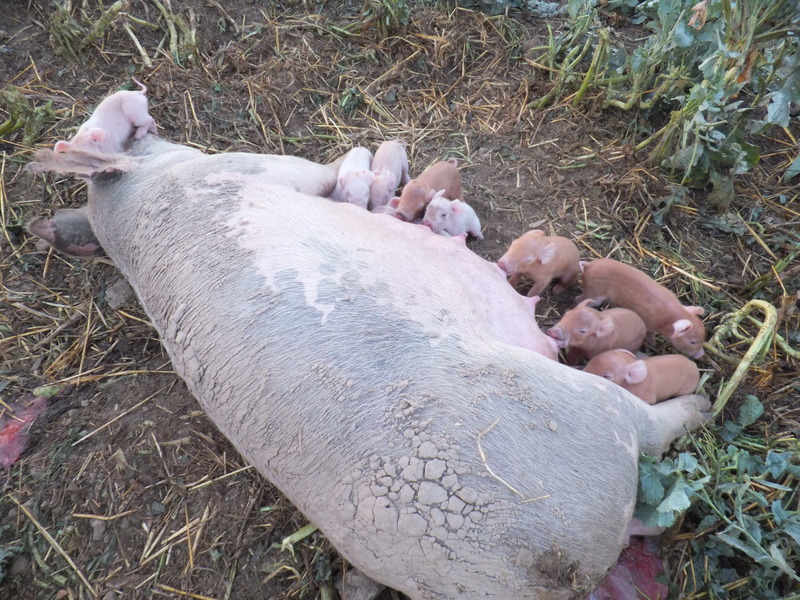 I realized the sow was eating it, and since none of the sows were leaving the nest for at least 24 hours for water or feed, I figured whatever nutrition was in the placenta may be beneficial. So for the fourteen gilt litters this summer I made a point to leave the placenta, while still removing any dead piglets. Researching this post led me to a greater appreciation of the placenta. One website says “the placenta is the only organ that belongs to two people at the same time.” Another website says the placenta functions for a baby’s vital organs. As a baby reaches full-term, the flow of maternal blood to the baby is around one pint per minute. The surface of the placenta is covered with what is basically a single cell with millions of nuclei. The surface area of this cell is over 100 square feet. While the placenta is amazing, the claims for placentophagy are not scientifically proven. This doesn’t mean they’re wrong, it just means they’re not proven. And in a case like this where the powers-that-be have little to gain, I think it may be some time before anything is proven. Being a man, I would never eat a placenta because it seems too much like cannibalism to me. But if I was an expectant mother I would give it some thought. If I made the choice to not eat the placenta, I think I would do like Native Hawaiians and plant it with a tree. This entry was posted on Thursday, September 26th, 2013 at 1:31 am and is filed under Curious hogs. You can follow any responses to this entry through the RSS 2.0 feed. You can leave a response, or trackback from your own site. More and more women are having their placentas encapsulated. It’s supposed to balance hormones, enhance milk supply, and increase energy. But…I’m glad I’ve never been confronted with what to do with my placenta (I have no kids). If I was offered it, the tree is probably the way I’d go, too. Still, the pigs probably know what is best. I used to attend home births . . . and I have to smile at the way you have arrived at an alternative perspective re: placentas. May I suggest that you might want to examine the placenta, the way we do following its expulsion. You may find tell-tale calcifications; you may compare the sizes of various placentas to see that some litters may be better nourished by a larger placenta (with implications for nutrition/hydration of the sow), etc. I have never known a woman to eat her placenta, though I have often seen it planted at the foot of a new tree. However, placenta is Latin for “cake,” so it would seem the invitation is there! We all have eaten organ meats–unless we are vegetarian. It is partly culturally determined, don’t you think? It is also an invitation to be open-minded . . .
Say…I wondered why I wasn’t getting your blogs…my email changed and it’s not being forwarded. karen_ferguson@me.com Would you change it for me please?!! Thanks so much!! Great fotos. Makes me want 2 acres and peace, quiet and dark skies w/ stars. I have to say..I miss thunder and lightening. I’m sorry about the struck cow though. I don’t like that part of it. Karen, I’m not sure I can sign up my blog for you. You should be able to signup with your new address. Thank you. Wow! So today I gave my presentation (with your photo of your cow eating placenta) on my own hypothesis of human placentophagy and postpartum depression. It went well, thanks for the picture! Of coarse I sited your blog and also told my farm-raised Cell-physiology teacher about your blog. She told me the story that she has noticed that cats on her property that consume the placenta are better mothers (possibly placentophagy is a cause, or a symptom, of whatever mechanism is making them be better mothers). I am glad you were unable to reach those placentas and the swine are being allowed to consume them, it seems best. Thank you, Carrie! I’m glad your presentation went well. It warms my heart when this blog contributes to a conversation.